Stable high pressure. they said. Cold but sunny, they said. Warm in the tent, they said. Big kites with long lines, they said. 200km a day, they said… Or was it my research that led me to say all that?? I always knew that we must try to expect the unexpected, and it seems that about this, at least, I was very much correct! The Spectre has been climbed once before by the legendary late US climber Mugs Stump who was acting as his older brother’s, and renowned geologist; Edmund’s field guide. In 1980, the year I was born, they with two others, were flown in a big C130 Hercules to a drop off on the California plateau, just a few kilometres from where we sit tent-bound right now. With snowmobiles they spent a month exploring and mapping the geology of this most remote region, and by all accounts had something of a field day collecting rock samples at different altitudes on some of the more aesthetic as well as geologically relevant peaks of course. Mugs and Ed summited the Spectre from the north side, a technical climb but considerably less formidable than the south spur that is our goal. 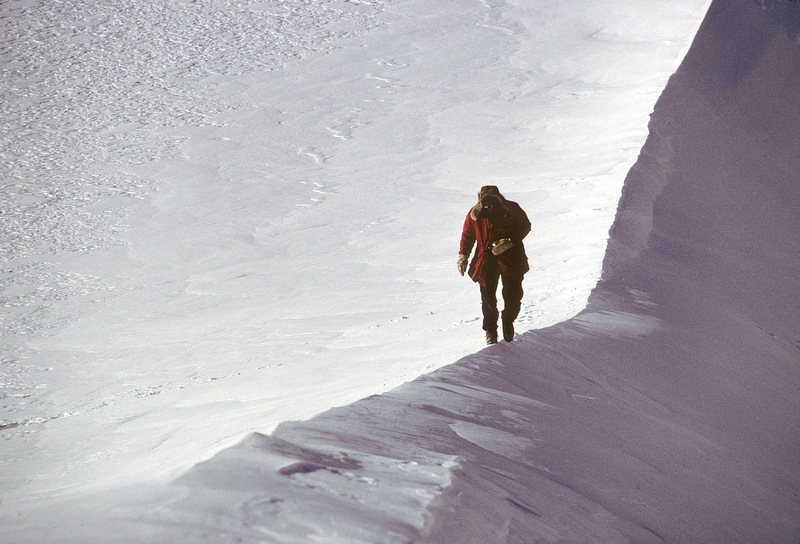 Both totally reliant on each other, Ed the professor, to harness the resource to get them to the base, Mugs, one of the finest Alpinists of his day, to lead them to the top. Sadly Mugs died in a freak accident guiding on Denali in 1990. I tracked down Ed in my research for this trip and throughout countless correspondence and two visits to his home in Arizona we have become friends. He has been an invaluable consultant providing dozens of excellent photos of the Spectre including some that nobody has ever seen, since they were filed in his archive 30 years ago, as well as accurate, first-hand accounts of the approach and terrain we are likely to face. 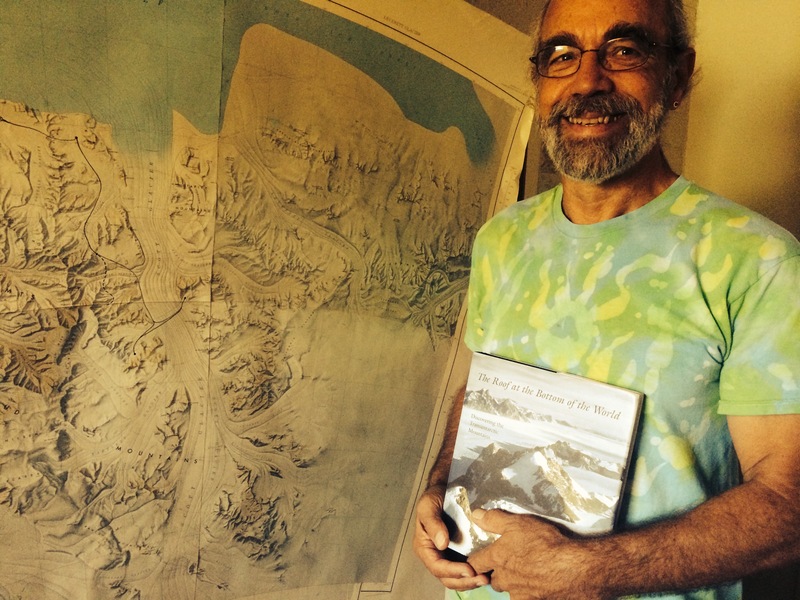 He wrote a book about the trans-Antarctic mountains called “The Roof at the Bottom of the World” and I have spent many evenings pouring over every detail. Uncle Ed, World authority on this region. At our current location, I can begin to recognise features from his photos and tent-bound as we are, I decided to send him an email last night. Already following this blog his response was almost immediate. For a man of science these are very artistic and poignant words. We are still below the Graves Nunatuks. Marginal conditions this morning. They are the worst. Good or bad conditions make for easy decisions. Quite a strong and gusty wind, changeable visibility from poor to fair and fairly flat light. We could dig deep and go for it, but we are pretty drained from so much difficult kiting and I would prefer good viz and light as we begin our descent down the Robison glacier so we are able to see the hazards that it may present. The last kite session was actually pretty damn full on, and I will not be sorry if we face nothing more serious for the rest of the trip. We have decided not to move. Which according to sod’s law means the conditions will likely improve. We are off schedule, as so far 5 out of 11 days have been no travel days. Then on the travel days we are only averaging 35km, half our intended target of 70km requiring twice the effort. But conditions have been poor. We haven’t had any friendly weather at all since we left Union glacier. I wasn’t anticipating such relentlessly strong wind. In fact I was concerned that we wouldn’t have enough wind to move with our big loads. We were expecting to mostly be using our big 15m kites on double length line sets. But we have been blasted, overpowered on our smallest wings every session. We allowed 10 days to reach the Spectre, but I honestly thought we would do it in 6 or 7. Today is day 11 and we are 100kms short and now beginning to break into our 20 days food supply meant for climbing. Sometimes I crave more purpose than adventure in itself, to be out here with proper scientific intention, as Ed &, Mugs were, whilst still so full of adventure must have been fulfilling indeed. Other times I count my blessings that I am able to call these hair-brained endeavours a profession. It is so invigorating, if exhausting being out here with no other purpose than trying to reach a very inaccessible point of earth and get home again safely. Ed’s words “reverence, perspective, transcendence” ring around my head as the wind rips around my tent. Just one stellar day and we could be at the Sanctuary glacier below the Spectre. And dare I say that tomorrow looks like it may be that day! Sure hope tomorrow is a great day for you! Fingers crossed for you tomorrow. You are due some good luck I think, so hopefully it’ll be favourable winds all the way now. Great blog posts Leo. I am sure things will get better. I hope Mark is not subjecting you to any of his music in which case I would really feel sorry for you. Thanks for all the honest blogs and great photos! Sounds like you made a good decision today; at least it allows you all more well deserved recovery time before you tackle the next demands of this great journey. Good luck with the weather gods guys. Keep at it lads and you’ll be there soon!!! You said….Sometimes I crave more purpose than adventure in itself, but you need to know how valuable what you are doing is to the history and memories of our children! My Leo thinks you’re amazing, he’s 5 and I’ve always taken him climbing in the Peak District, he has your autograph on his wall. Mostly he thinks it’s anazing you have his name and also climb, but today you’ve become as exciting as opening a Lego Star Wars advent calendar!!! That means you guys are as important as Christmas, what more purpose do you need. Thank you for inspiring and keep positive, you’ll get there. Well Lad’s , keep the chin up , all 21 extremetie’s dry and warm , 2moro is another day , easy to say from where we are ….. But , when it clears up …….. Zoooooommmmm ! Base Camp ! Rest up and recharge Lad’s . We are enjoying the blog , so ….. Over and out …. As of the opening of this entry I thought you’d end up quoting all the Bowie’s song (1). Curiously, the last months been reading throught Stumps, Blanchard, Lowe quite a lot under the Steve House umbrella. I guess it would be an interesting debate to see you both disecting whether alpinist or bigwall style would be the grial or the only acceptable Antartic style to come. Much like that prophetic article on Huber/Zak book… whatever. Good thing that is you who is stuck there, most of the people would become frozen jelly or nuts as a character from Lev’s “Solaris”. Don’t start singing “My way”. “Typerary”… much better, I recall singing it to Freya the time I had her in my arms training for my own parenting. Incredible effort guys … keep strong. Seriously impressed! I met Ed Stump two years ago when he gave a talk at a meeting, and of course bought his book. An impressive tale…as is the one you are in the midst of! Thanks for the link Bill – I’ve added it to the main blog post. Loving following your journey – our family, from my 86 yr old father to my 7 yr old son have been following! Quick question from my 10 yr old son, James…who named Spectre and when? Good luck with the weather, and maintaining such an awesome attitude. Spectre was named by Edmund Stump in 1980. He also named the group the Gothic Mountains. The first people ever come here were a 3 man team with dogs led by Quin Blackburn in 1933. They named the chain of mountains of which the Spectre is one the organ pipe peaks because they look like the pipes of a cathedral organ. This is the stuff of dreams.You are part of the Antarctic adventure story which has such a distinguished heritage. Fortune favours the brave. Stay well & safe. 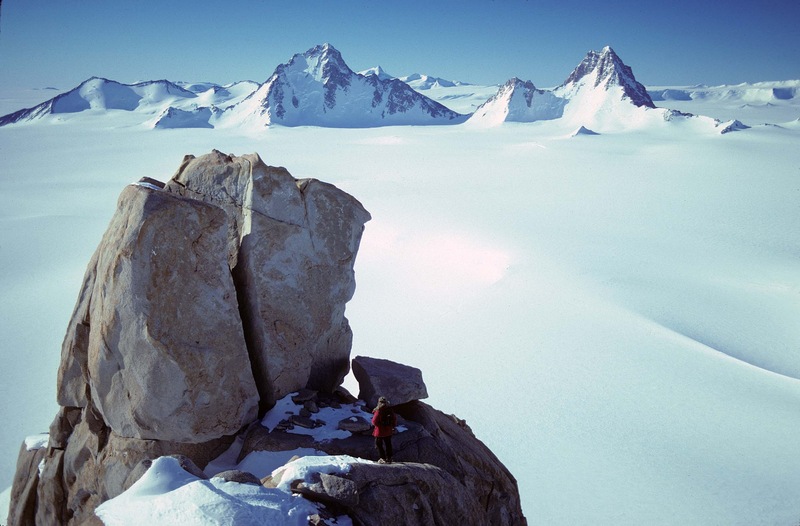 Your quest is part of the distinguished Antarctic adventure story. It has real purpose. A great modern adventure with great exploration spirit! Good luck guys!! Awesome effort guys. Just got into kite skiing down here in NZ with the Wanaka crew. Great to see this being promoted/used as a form of Alpine/polar travel for Alpine objectives!